If you meet a guy who has a five-egg omelette and three fried egg sandwiches laden with cheese and mayonnaise for breakfast, youa��d probably call him a glutton. And if you were told that he has a 12,000-calorie diet when the average male has 3,000 calories, youa��d probably think hea��s headed straight for a heart attack. But the difference is, wea��re talking about Michael Phelps here. With an unimaginable 23 Olympic golds to his tally, this swimming legend trains like a maniaca��swimming for six hours a day and running on land for 120 minutesa��burning so many calories that he constantly needs to fuel his inner submarine. In the Rio Olympics, he hauled five golds and one silver at 31, an age when most of his peers would have been swimming with pigs in the Bahamas. Youa��d be surprised to know though, that he drew a blank in his first shot at Olympics. He finished fifth at Sydney in 2000. But then he was barely 15. Another giant who had a terrible first Olympics was Usain Bolt. He was selected by Jamaica to run the 200 m race at the Athens games in 2004. Hampered by an injury, he didna��t even make the cut. Many wrote him off. But the Lightning Bolt bounced back to become the Worlda��s Fastest Man with the unbelievable record of pulling off a triple-triple in three consecutive Olympics. A juicy fact about him is that the name, Usain, was chosen by his mother on the suggestion of a 12-year-old boy who told her it means a�?beautifula��. Incidentally, till the age of 12, his mum always used to beat him in races that they never timed. 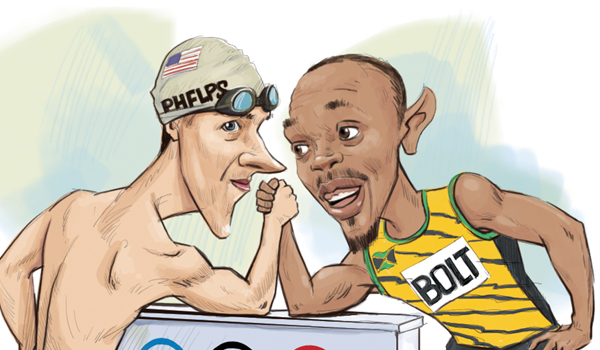 Curiously, Bolt has an equally legendary appetite like Phelps. During his 10-day stay at the Beijing Olympics, hea��s supposed to have gobbled up 1,000 chicken nuggets and loads of French fries. His weakness for food might have prompted him to open a sports themed restaurant called Tracks & Records at Kingston. Which of these two greats is the greatest? If one goes by the glitter of gold, ita��s got to be Phelps. The heart, however, doesna��t merely go by numbers. For being a charming trailblazer from a tiny island nation, Bolt wins the race by a mile.